(CNN) -- Ancient footprints discovered in northern Kenya are believed to be the oldest sign that early humans had feet like ours. The footprints were found in two sedimentary layers, 1.5 million years old, near Ileret in the eastern African nation. "These rarest of impressions yielded information about soft tissue form and structure not normally accessible in fossilized bones. The Ileret footprints constitute the oldest evidence of an essentially modern human-like foot anatomy," according to a team of anthropologists who detailed the discovery in the February 27 issue of the journal Science. The team, led by anthropologist Professor John W.K. Harris and an international group of colleagues, excavated the site between 2006 and 2008. Harris, who teaches at Rutgers University and the State University of New Jersey, is a member of the Center for Human Evolutionary Studies and directs the Koobi Fora Field Project. 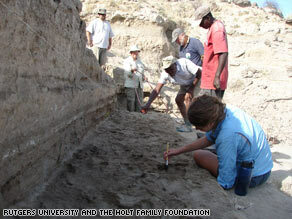 The ongoing excavation project is run by Rutgers in collaboration with the National Museums of Kenya. Koobi Fora refers to a region around Koobi Fora Ridge, located on the eastern shore of Lake Turkana. The area has been a rich resource for excavations. According to the authors of the journal article, there were three footprint trails in the upper sediment layer. Five meters deeper, another sediment surface preserved one trail of two prints and a single, smaller print, likely from a child. "In these specimens, the big toe is parallel to the other toes, unlike that of apes where it is separated in a grasping configuration useful in the trees. The footprints show a pronounced human-like arch and short toes, typically associated with an upright bipedal stance," the scientists said. "The size, spacing and depth of the impressions were the basis of estimates of weight, stride and gait, all found to be within the range of modern humans." The size and other characteristics of the prints led the authors to conclude the prints belonged to the hominid Homo ergaster, or early Homo erectus. This is the first hominid to have had the same body proportions -- longer legs and shorter arms -- as modern Homo sapiens. Other hominid fossil footprints dating to 3.6 million years ago were discovered in 1978 by Mary Leakey at Laetoli, Tanzania. "These are attributed to the less advanced Australopithecus afarensis, a possible ancestral hominid. The smaller, older Laetoli prints show indications of upright bipedal posture, but possess a shallower arch and a more ape-like, divergent big toe," the authors said.